Wind in my sails, wind in my sails... - Welcome to The City of Desire. Look at my giant cosmos! 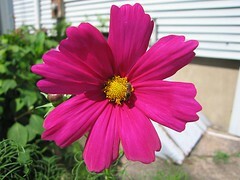 I love the startling magenta color of this cosmos. Unfortunately, these plants have grown so tall in the pots that even a gentle breeze sends them flying across the deck. Next time I'll ignore the packet's assertation that these 30 inch tall flowers are great for container gardens, and stick to dwarf cosmos blends like Sonata. I'm actually really tired of cosmos, but the bees and hummingbirds love them. I have no choice but to continue growing them. The nice thing about growing flowers in pots is the fact that you can move them around the yard to find the best lighting for photographs.